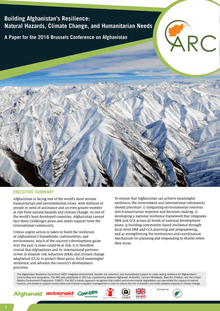 This position paper of the Afghanistan Resilience Consortium prepared for the 2016 Brussels Conference on Afghanistan calls on the country and its partners to allocate greater political, technical, and financial resources to building the country’s resilience to natural hazards and climate change. Afghanistan is facing one of the world’s most serious crises, with millions of people in need of assistance and an even greater number at risk from natural hazards and climate change. In May flash floods hit the Khuram was Sarbagh district of Samangan leaving communities with no time to prepare and wreaking devastation on already vulnerable households. Alongside 30 years of conflict, Afghanistan is prone to natural disasters such as floods, earthquakes and drought, which have been occurring with increasing regularity over recent years. On Friday, 2nd May landslides engulfed two villages in the remote and mountainous in Argo District of Badakhshan Province in north-eastern Afghanistan. It was last reported that 2,500 lives were lost. Over three hundred dwellings were destroyed in this harrowing natural disaster, caused by recent very heavy rains in the north of the country. The final death rate will not be known for some time. Abu Ahmad lives in Bahrak, a district located near the Afghan border with Tajikistan. He and his fellow villagers have suffered from years of poor farming and livestock production due to drought and war. Afghanaid gave Abu his first beehive and he has never looked back. The World Health Organisation estimates that each year in Afghanistan 82,100 children under the age of 5 die from diarrhoea. At Afghanaid, we find this shocking statistic unacceptable. We know that you do too. In order to reduce these unnecessary deaths, children and communities require improved access to clean water and good sanitation as well as a basic understanding of good hygiene practices. Afghanaid works alongside poor, vulnerable and marginalised people to enhance their opportunities and capabilities. Afghanaid is a registered UK charity with a small London team. The head office resides in Kabul, Afghanistan with provincial offices in Samangan, Badakhshan and Ghor. UK Registered charity (1045348) since 1983. In the above photo, three women stand beneath two posters of the Ka’aba in Mecca. Their gear may look a bit out of the ordinary, but in fact it is essential for the important and often dangerous work they undertake. Real Afghanistan. Real Needs. Real Afghans. Has everyone lost hope? Is everyone tired of Afghanistan? When public support fades for the military intervention, there is a danger that support for the Afghan people and their livelihoods will fade as well. This is not because human desire to help is diminishing, but rather because the general public does not see real Afghans and their real needs on TV or on the front pages. 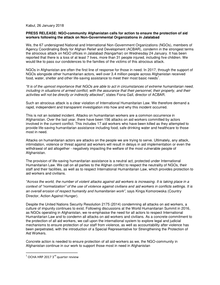 Statement on the drought in Afghanistan produced by a group of NGOs, including Afghanaid. Statement released 31 August 2011. In March Afghanaid celebrated 10,000 days in Afghanistan with a 10-day campaign featuring testimonies from long-time supporters. Badakhshan is located in the north-eastern part of Afghanistan and is one of the most remote and least developed provinces in Afghanistan. In the north, it shares a border with Tajikistan and on its northeast and southeast lie China and Pakistan respectively. The slogan ‘from aid to empowerment’ encapsulates our vision of how development should be delivered. For Afghanaid, ‘aid’ is not only about responding to emergencies. It’s about building the capacity of Afghan communities to make better lives for themselves. 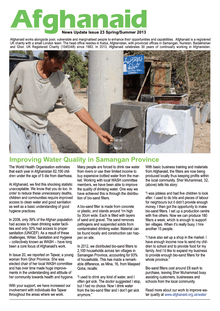 On 19 April 2010, an earthquake measuring 5.3 on the Richter scale struck Samangan province in northern Afghanistan. This resulted in the death of 8 people and 50 injured, with homes in more than 50 villages completely or partially destroyed in the districts of Dara-i-Sufi Bala, Darai-Sufi Payin and Ruyi Du Ab. The NGO and Humanitarian Reform Project (NHRP) has as its main objective to strengthen the effective engagement of local, national and international humanitarian NGOs in reformed humanitarian financing and coordination mechanisms at global and country levels. On the 28th January London hosted a conference to engage world support for Afghanistan. 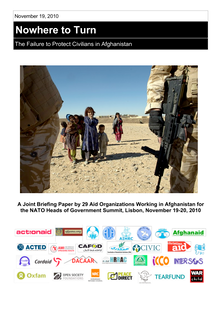 This Good Practice paper focuses on Afghanistan, looking at the cluster process of the 2010 Central Emergency Response Fund (CERF), particularly centered on the underfunded allocation to Afghanistan and the inclusiveness of the process undertaken within the clusters. The CERF is a humanitarian fund established in 2005 by the United Nations to enable timely and reliable humanitarian assistance to those affected by natural disasters and armed conflicts. Afghanistan is the sixth largest recipient of CERF funds. Afghanaid is an international non-governmental organisation and has been present in the country since 1983. It has more than 400 staff, over 90 percent of them Afghans, operating from 18 field offices across four provinces: Badakhshan, Samangan, Ghor, and Nuristan. Our work is spread in 2000 villages. 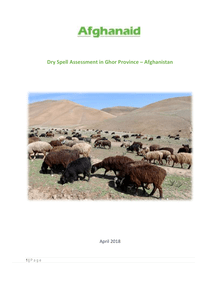 Ghor has some of the starkest indicators of isolation, poverty and under-development of all provinces in Afghanistan. Today, a vast majority of Ghor's population struggles to survive.